Great news for our customers in Georgia, Alabama, north Florida, part of South and North Carolina and part of Tennessee. Сheck our best shipping rates for Overnight Services exclusively provided by FedEx Ground. We're glad to introduce the new black caviar "Hackleback Black Caviar" with its exquisite taste. Especially selected and available for online purchase. 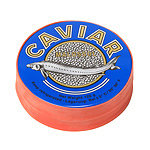 Fresh American Black Caviar, Royal Siberian Sturgeon Caviar, and Wild Alaskan Salmon Red Caviar at the best price directly from manufacturer!